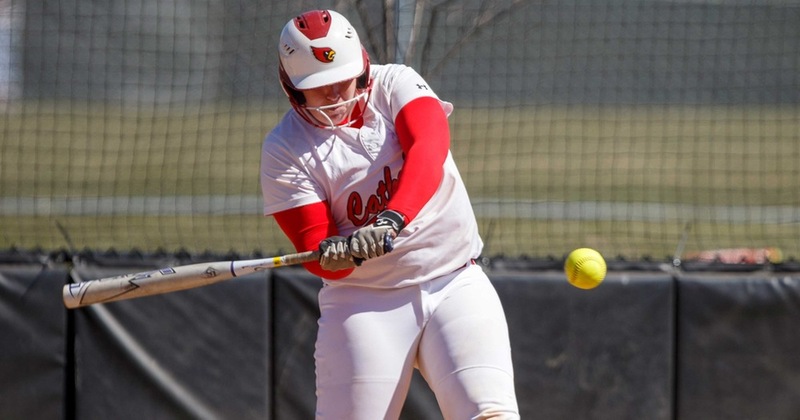 The Lady Cardinals softball team finished its Landmark Conference play with a 7-5 (17-13) record following a weekend sweep over Juniata. The team will be taking the fourth and final spot of the conference playoffs. Senior Alyssa Keane stood out as she went 3-of-6 in the two games, recording 7 RBIs including a grand slam in the first game. Keane has delivered a strong performance throughout her final season for the Cards, hitting career highs in home runs (5) and RBIs (24) on 27 hits. She has done all of this while making 20 less appearances at the plate than last season. Keane earned her first RBI in the third inning of the first game, when she singled up the middle to drive in two runs. Rookie Juliet Lodes drove in an RBI of her own in the top of the fifth before Keane blasted her grand slam to win the game at 7-6. Junior Kelly Lynch recorded her 10th win on the year throwing for 5.2 innings of work. She was relieved by freshman Allie Lajeunesse who struck out 3 batters in just 1.1 innings of work. The second game was an equally-efficient offensive contest for the Cardinals, as they began their scoring in the third inning. Colline proved patient as she drew a bases-loaded walk to score a run, while Keane ripped another single to drive in another run before the close of the inning. The game remained at a 2-2 stalemate until the fifth inning when junior Rebecca Marks hit an RBI single scoring rookie Taylor Forgen for the game winning run. Catholic would score two more runs in the seventh to end the game at 5-2. Sophomore Sabrina Scott started for CUA in the second game and delivered 3 strikeouts in her complete game on the mound. The Cardinals close out their regular season with a two game doubleheader at Hood College on Sunday, April 29th. The team will use this as one final warm-up game before plunging into the postseason. The team is slated to play on the road against the highest-seeded team from the Landmark Conference as they’re locked into the fourth seed.